Customer surveys (n=118) for the company (Bob&Lush.com) found that customers were very often concerned about how quickly they could get the product after running out. After 1,877 unique visitors tested we concluded that adding urgency (via a time-sensitive shipping option) to product pages resulted in a revenue uplift of 27.1%. Looking at secondary goals resulted in a stable conversion rate uplift of 9.5% and a 10.1% increase in checkout visits during the testing period. Neither of these were statistically significant, yet they supported the main goal and show a stable performance during the six-week period. Bob & Lush is a premium dog food supplier in the UK, with an e-commerce site active in several countries in Europe. They pride themselves in using lots of fresh meat and real vegetables. Their products are hypoallergenic with no fillers, sweeteners, or artificial preservatives. After conducting conversion research according to ResearchXL, and running several treatments on their site, we achieved a stable increase in their conversion rate. Below, we introduce a treatment that triggered a sense of urgency in their customers and resulted in a revenue increase of 27.1%. Customer Research – A survey was conducted on 118 recent Bob & Lush customers (69.5% female, 30.5% male). There were many findings in the survey that provided for various testing ideas. The one finding relevant to this case study was concerning customer’s fears of running out of food for their dogs. According to Bob & Lush customers, one of the biggest purchasing fears was knowing when the food would arrive. Dog food is a necessary good that is usually only purchased when the customer runs out. The product page did not have any specifically targeted urgency triggers and our hypothesis was adding a clearly visible urgency trigger would activate the user to complete the purchase straight away. During one of the multiple tests performed, we added a sense of urgency on the Bob & Lush product page. We wanted customers to come to a faster decision about buying the product, instead of browsing around and possibly navigating away from the purchase page. The increased urgency added value which enticed the visitor to come to a faster purchasing decision. 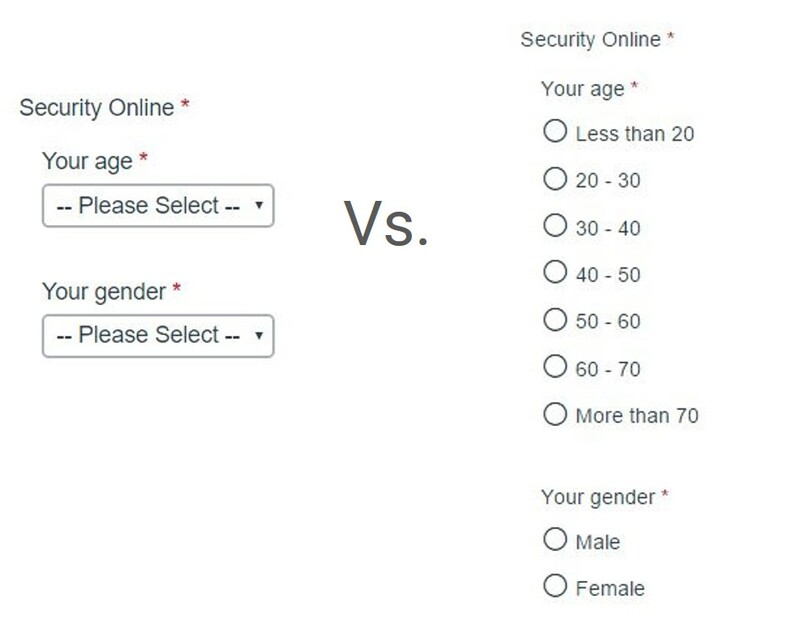 The customer research provided the hypothesis that adding urgency on the product page would lead to higher conversions as people would have less time to think and would instead follow their impulse to complete the purchase now rather than later. This urgency message was placed just below the product name ensuring that it fell into the reading pattern of all visitors interested in the products. To ensure the treatment was only shown at the right time and for the right people, we added a condition: The treatment would only be displayed Monday-Friday before 4 PM (UK IP). The test ran for two weeks: Jan. 10, 2015 – Feb. 24, 2015. Testing platforms utilized: Optimizely (for the test), Qualaroo and Typeform (for surveys). The product page urgency A/B test ran for 42 days (6 full weeks) with 50/50 traffic allocation and 95% confidence. After 1,877 unique visitors tested we concluded that adding urgency (Variation 1) to product pages resulted in a revenue uplift of 27.1%. Looking at secondary goals resulted in a stable conversion rate uplift of 9.5% and a 10.1% increase in checkout visits during the testing period. Neither of these were statistically significant, yet they support the main goal and show a stable performance during the six-week period. It goes without saying, but there’s no silver bullet solution in conversion optimization. Urgency often works, but sometimes it doesn’t (it can even backfire). But according to our research, it made sense to test urgency and product pages and we saw a pretty clear winner. Great case study love the hypothesis. One question: Shouldn’t the main goal be purchases and not revenue? The hypothesis is that more people will PURCHASE when presented with urgency not that people will spend more money (avg order size) . As I understand you did not run that test on entire site? Why? First, we had a different tests running on some other pages of the site. Second, you only have limited space. If you push one message across all pages of the site you must be sure it’s relevant everywhere. Otherwise you’re just adding distraction. With the execution shown above the message was displayed on all product pages right below the product name – making it part of the natural flow of the eyesight, plus numerous elements such as the color orange and the box around it were used to draw even more attention to the message. Sure some people may have missed it, we can never guarantee that, but based on the results the majority didn’t. It would however be an interesting test to display the very same message site-wide and test it against the current winner, but that would be a whole different treatment. Did you change the layout of the testpage compared to other pages? In the opening shot of the blogpost the arrowshaped basket button is all the way on the right side of the screen. In your test variations you’ve set it to the left causing the basket button to point out the price, weight and amount forcing your eyes to go back against the flow to the basket button. Is there a reason for this discrepancie? No we didn’t. 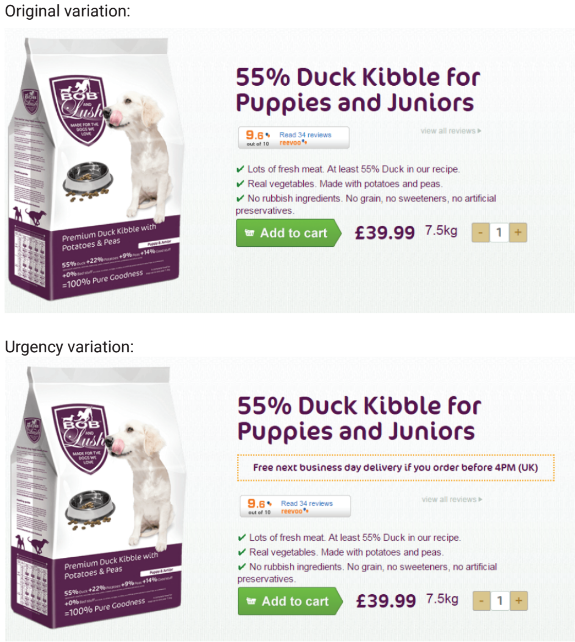 At the time when this test was conducted the layout of the above the fold of the product pages was exactly as shown with the original treatment variation. The screenshot in the beginning of the blog post is illustrative and depicts what the above the fold of the product page looks like now. Interesting article and on the face of it a good result. I’m always careful making decisions based purely off revenue. As a metric it takes longer to mature given its non binary nature and the risk of outliers that can present. Id be far more comfortable with this result if sales were also up statistically. It seems unusual that urgency for delivery would drive more on basket value then conversion. Also, with 300 visits a week i would be interested to see the count of sales that delivered this result which may be on the low side. Although you could argue that the 6 week run time gives the campaign a good 6 weeks cycles for the user sample. A question. What was the test generation logic for the 1877 visitors? Seeing a product page? Adding to cart? I’m a little confused, because 1877 unique visitors over the course of 42 days means you’re getting around 45 visitors per day. Testing to significance at a 27% increase in conversion would probably take at least four months, definitely longer than 6 . If we assume a starting conversion rate of 6% (which is on the high side) it would still take 150 days. Am I missing something? We applied same similar stuff for petbesinleri.com.tr and it is one of the biggest online pet shops in Turkey.